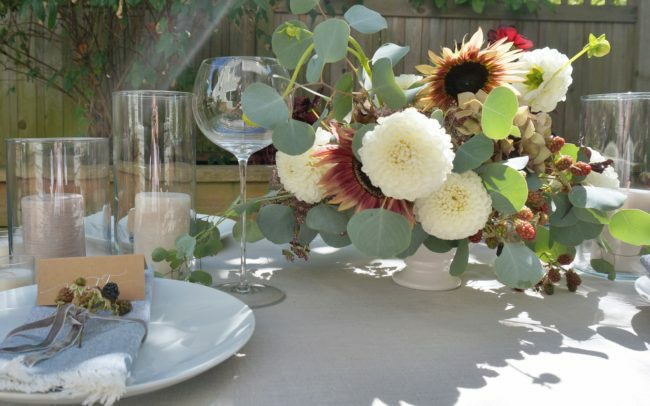 Carina Van Son of Carina Van Son Weddings is here today as a contributor to the AllSeated blog to discuss the various ways to choose your event centerpieces. Thanks Carina! Choosing your centerpiece can become almost as challenging as finding the perfect dress for your day. Table centerpieces are the focal point of the dinner table and most times they provide the inspiration for the rest of the reception décor. I love to mix and match candles, flowers, and unexpected elements like berries for centerpieces, creating a tablescape more than just a single arrangement. In selecting the perfect option, there are a few factors I’d recommend taking into consideration before making any decisions or spending money on your DIY inspiration. I recommend this to all my brides with most aspects of their wedding. Although it’s great to get inspiration from magazines, Pinterest, and weddings you see in blogs, every couple wants a day that is uniquely theirs. It’s great to use these resources for brainstorming, but when it comes to making décor decisions, think outside the wedding box. Take a look around your home, your closet, your favorite places. What colors do you gravitate to? What is your signature style? What was your favorite vacation/ holiday/ date as a couple? Use these elements to influence the look and feel of your wedding and centerpieces instead of the latest trend. Once you have a general idea of your theme and look, consider the season of your wedding date. Use nature’s timing to influence your centerpiece. In the spring there are an abundance of new blooms. Summertime brings fresh fruits and vegetables to incorporate onto the table. Use brilliantly colored fall foliage and branches in the autumn, or let your winter wedding glow with candlelight and frosted evergreens. One of the biggest things my clients miss when choosing what to do for their centerpieces is thinking of its height. Most home flower vases are not meant to be table centerpieces. Fill them with flowers and you’ll have guests bobbing and weaving to converse with each other all night. Test out your ideas on your table at home. Can you see across the table? A good rule of thumb is to have the centerpiece at about the same height as the wine glasses. I tend to go for low compote style bowls to create this. Another option is tall thin vases with arrangements or branches that bloom overhead. 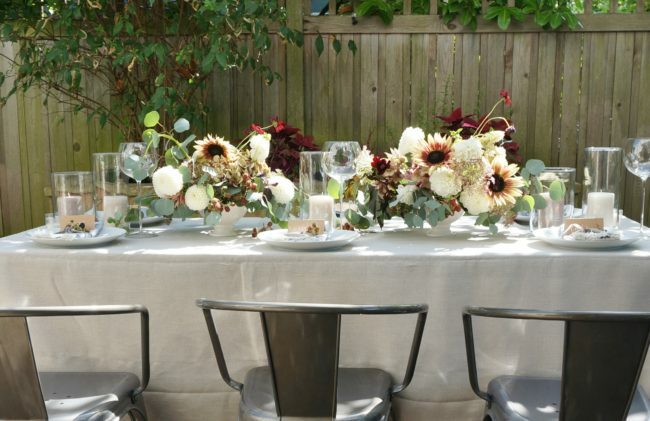 Even better, create a mix of both high and low centerpieces alternating throughout the tables. Before buying 20 vases or lanterns for centerpieces in hopes that you’ll be able to sell them on craigslist after the wedding, look into rental companies in your area. Many of them deliver to the reception site or florist’s studio. Depending on the company, you’ll be able to find a variety of styles. Whimsical, simple, modern, glamorous… Most rental companies collect an assortment of pieces from different eras and looks. Finally, before making any decisions, talk to your wedding planner or event designer. Your planner is thinking of the big picture. He or she not only takes into consideration the floorplan and logistics, but they are also weighing all the details as well. They can give you suggestions of what might work best with the look and feel you are going for. They are also your “go to” resource guide. If they don’t have pieces in their collection that are available to you, they will know of vendors to rent from or preferred stores that can provide the look at the quantity and price that fits your budget. Learn more about Carina Van Son Weddings by visiting their website. All photos used with permission from Carina Van Son Weddings.